You may have heard that on May 23rd, 2012 there was a devastating fire in Bethel Island (click here for news story) that burned down two homes. What you didn’t hear about were the colonies of feral cats who lost their homes and lives that night. The night of the fire, this little 4 week old kitten was brought to us on emergency by a neighbor of the fire struck area. 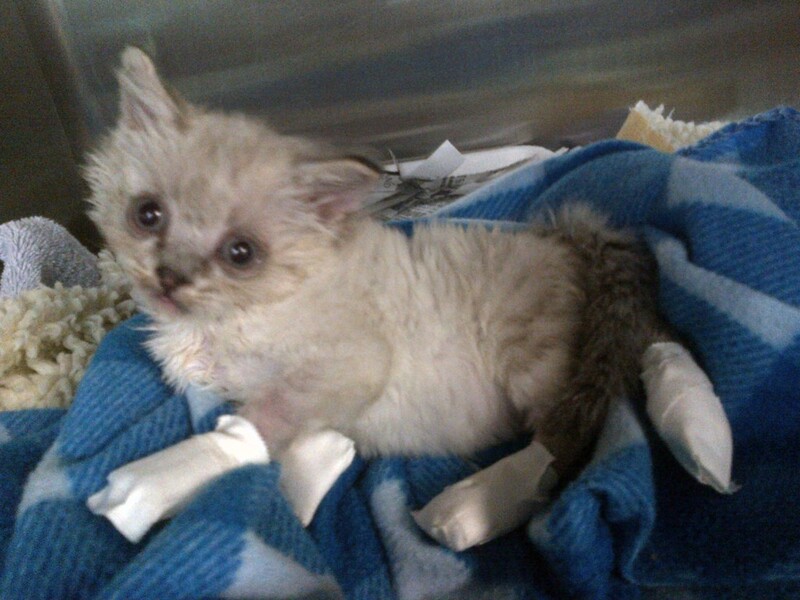 At the time, he was named “Amazing Grace” because of his miraculous survival among the feral cat colonies. The woman who brought us to him told us the story of how he had a sibling a mother that often were found nesting together under a car. 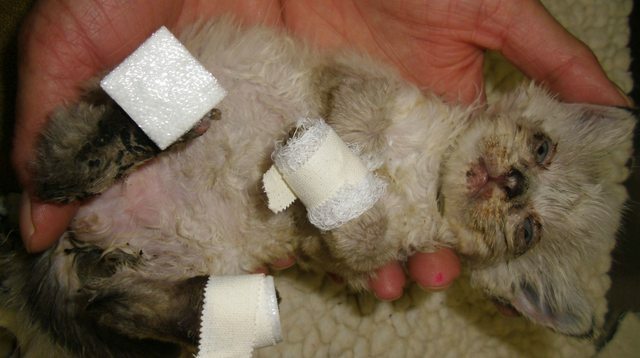 The woman believes that once the flames started, the mother kitten could only carry one kitten to safety; sadly it wasn’t this guy. He crawled out from under a car on his own while flames chased him and ended up pinned next to a fence where the kind woman came and rescued him. 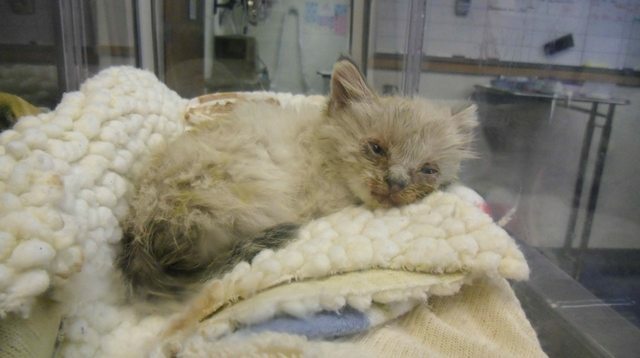 By then, “Amazing Grace” was in critical condition facing issues such as severely burned paw pads, whiskers burned off, eye irritation, melted fur, small burned patches and smoke in his lungs. Our registered veterinary technician, Barbara, was working the night “Amazing Grace” came in. The woman who rescued him from the flames was unable to keep him herself but she wanted to be sure he got the best of care, which is why she drove from Bethel Island all the way to us, in Walnut Creek. Barbara decided right then and there that she would take responsibility of the kitten and find him a furever home as soon as he recovered. The best part is that Bernie has nuzzled his way into the heart of one of our other Registered Veterinary Technicians, Nicole, and has found his furever home already!